The following is an article I wrote 11 years ago while a sports writer, republished verbatim and borrowed with permission from The Lynchburg (Va.) News & Advance. Please find commentary about the piece at the bottom. BEDFORD (Va.) – It doesn’t take long to see that Mike Cottrell is an avid outdoorsman. Eight or so mounted bucks hang throughout his house, evidence of the countless hours Cottrell has spent working the woods for the majestic whitetail deer. Most of those hours, though, doubled in enjoyment for Cottrell because he was spending time with his best friend, Al McFaden. This season marks the first time in 21 years Cottrell won’t be venturing into the woods with McFaden, who died May 7 at 47 after a battle with cancer. The excitement that normally precedes hunting season for Cottrell isn’t quite as strong this year. Hunting without his best friend just won’t be the same. Cottrell pauses for a moment and just shakes his head and smiles. “He was the perfect hunter. No one ever said losing a best friend is easy, but Cottrell says that McFaden was more than a best friend. Cottrell remembers the day the pair met in November 1978 as though it were yesterday. They were both starting their first day on the job at Siegwerk Ink, in the prime of hunting season. It didn’t take long for the two to start taking their hunting interests afield and begin the bond that would carry them for the next 21 years. 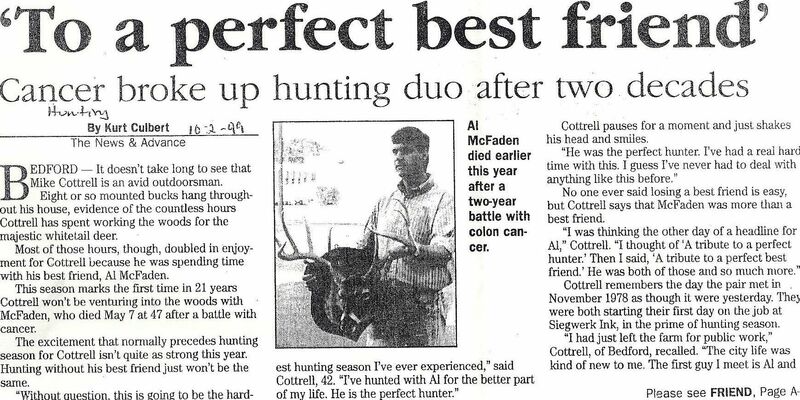 The memories Cottrell has of hunting with McFaden seem countless. Most of the time, the two hunted with Cottrell’s brother-in-law, Randy Walker. But a few stories stick out in Cottrell’s mind. Judging from the smile on his face, they’re all no doubt pleasurable. An article was written about the adventure the two had in November 1985, when Cottrell shot his first bear. On a dreary, rainy day, the two went into their normal hunting area in Bedford County for a quiet, still hunt. To get out of the rain, Cottrell crouched at the base of a tree and awaited the rain and his friend. Cottrell grabbed his gun and shot the bear on the run. It turned out the bear had actually been sitting under the same tree as McFaden. Another time, the two had rested from an early hunt and were standing, talking and drinking soda and eating a candy bar. They could hear a housedog chasing deer just over a ridge. Cottrell went out looking for the deer, which ended up being a “huge buck.” With a broadside shot well within range, Cottrell pulled the trigger only to discover he had no shell chambered. After getting a shell loaded and finally getting re-situated, Cottrell ended up getting a shot at the monster buck. The two waited an hour before beginning the search. They found a speck of blood where the buck was last seen and began what turned out to be a six-hour journey for miles through the Blue Ridge Mountains. The buck turned out to be the largest Cottrell has killed with his gun, a 10-pointer with extra-long tines. Cottrell remembers McFaden as a family man who is survived by his wife, Cynthia, and two children, Scott and Tracy. The hunting group grew a bit in recent years when McFaden’s son Scott began to join them. 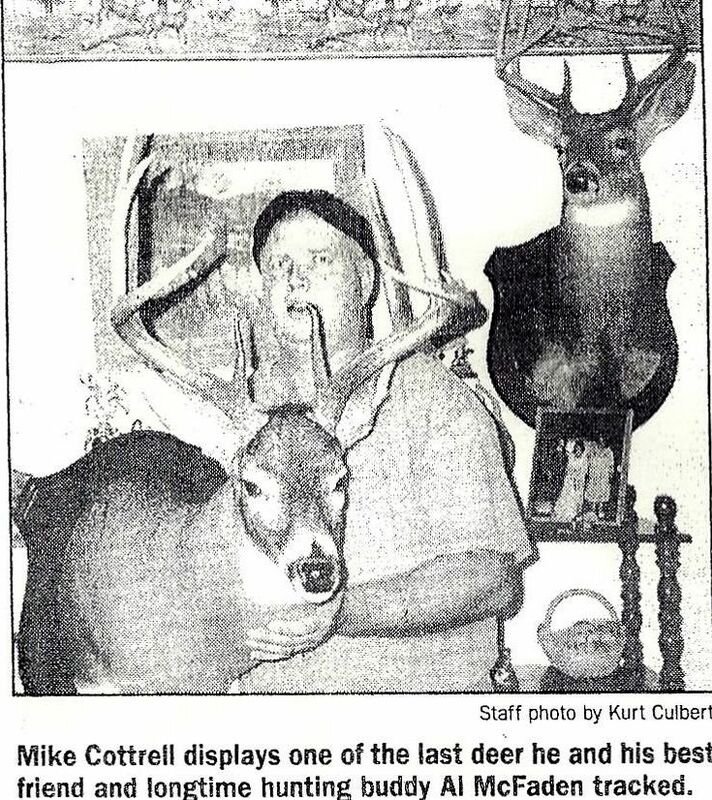 Cottrell remembers when Scott was able to shoot his first buck. Last hunting season was memorable in other ways for Cottrell. After a nearly two-year fight with colon cancer, all indications were that McFaden had defeated the disease. “He kept going back for regular check-ups and they gave him a clean bill of health,” said Cottrell. During hunting season, McFaden began to get sick. “I knew it was different than a normal sick,” Cottrell said. “I told him that he needed to go back to the doctor. They ended up telling him the cancer had spread and it was getting worse fast. He asked them for a timetable and they said they couldn’t be exact, but maybe two or three years. His vigorous battle with the disease didn’t last long: He died six months later. “You know, he was a real winner,” Cottrell said. “His battle with cancer was the only thing I’ve ever seen him lose. But, he was still a winner because of all the lives he touched while he was here. Looking ahead, Cottrell hopes he gets excited for the upcoming season. “It’s gonna be hard. Al’s not here with us to put a smile on our face, but he’s gonna be in our hearts doing it. I know he’s flashing that ‘Colgate smile’ in heaven. I remember the day well when Mike Cottrell was escorted to my desk in the newsroom in 1999. He had his hat in is hand and was hell bent on finding a way to honor his hunting buddy. He was clearly hurting from the loss several months earlier and I’m not sure he expected to find someone who shared a passion for the outdoors when we chatted by my desk. Then again, I’m not sure I expected to find one of the kindest-hearted human beings I’ve ever met. This story was one of the easiest I ever wrote and ranks among the top-two articles ever in feedback volume. I am so thankful that I got to meet Mike that day, to get to spend a day with him at his house talking about his friend, and later sharing opening day of the 1999 Virginia opener with him in the same woods that he and Al used to travel. It was on that day that I shot my first Virginia deer, a basket racked buck on a beautiful mountainside atop a large rock that Mike dropped me off at before daylight. And to top it off, Mike shot a dandy 8 point that morning as well. Sadly, I have not connected with Mike in quite some time. Thinking of this article has sent me on a mission to find him and see how he’s doing. I will do that immediately. I’m not sure the reach of this story really hit me until I walked into my cousin’s deer camp that same year, in Western New York, to find the article framed with a small note reminding his guests that the article’s homage to a hunting buddy was “what it’s all about.” The article still hangs there today. Have you ever been turned down by a taxidermist? I have. And three duck mounts and several hours of trading hunting stories later, I know why. Mark Benfield is the best waterfowl taxidermist I’ve ever come across. It’s that simple. A hunting buddy who felt the same way about his work recommended Benfield, who owns and operates Mark’s Waterfowl Creations in Lincolnton, NC, to me several years ago. So imagine how excited I was to take my first bull canvasback to him after it made the delicate journey from North Dakota. Imagine my surprise when Benfield spent less than a minute looking at the duck before telling me he wouldn’t be able to mount it. 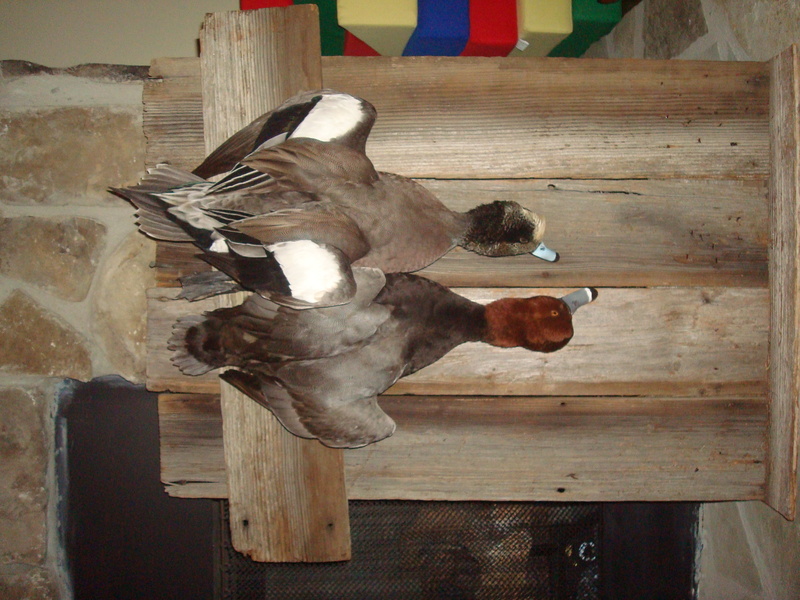 The most recent additions to my game wall - widgeon and redhead mounted by Mark. Benfield has a scoring system for birds he takes in and if it doesn’t fall on the right end of his spectrum for mounting, he will tell his customers not to mount the bird. It’s not that Benfield is arrogant or overworked that he has to turn it away. He doesn’t want his customers to be unhappy. Imagine how hard I worked to shoot a duck that would meet his expectations for mounting. The following season, Sage’s first as my hunting buddy, saw us shoot two beautiful drake woodies that I knew had to meet his threshold. And both did so I chose to mount the first duck Sage ever retrieved. Lucky for me, it turned out to be one of the most beautiful mounts, of any species, I’ve ever seen. The most beautiful mount I've ever seen. I am biased! And on a coastal trip in North Carolina last year, I was fortunate to shoot a drake redhead and drake widgeon that made their way to Mark’s taxidermy shop. And instead of missing the scale, the widgeon actually topped Mark’s scoring system – a feat that seemed to impress even the best bird taxidermist this blogger has ever seen. I opted to get the ducks mounted in a dead mount against an old barn-board frame I built using wood my buddy Kenneth and I took off an old barn a few years back. I couldn’t be happier with his work on those birds as well. 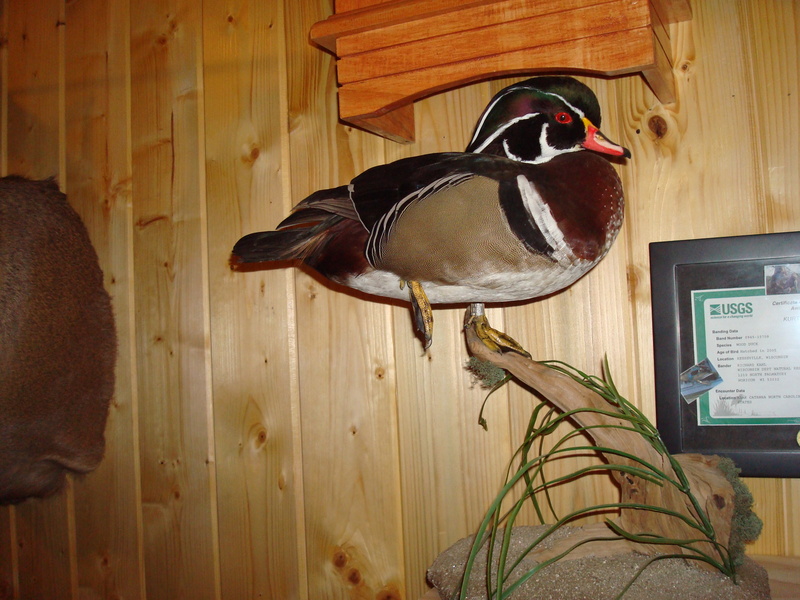 I’m not the only one who has noted Mark’s work, evidenced by his 2007 National Championship in waterfowl and Blue Ribbon Awards in both the World and State taxidermy competitions. For you out-of-state hunters, I promise the shipping prices to get Mark a bird for consideration would pay off when any mount is completed. He is truly that good. Tales … I need to send congratulations to my fellow outdoors blogger, Nick Pinizzotto, who connected on a sharp looking 10-point on Pennsylvania’s archery opener earlier this month. Nick, who blogs at www.whitetailwriter.com/rublines/, is done bowhunting until we meet up with him at Riverview Outfitters in Hancock County, Ill., in four weeks. He reports that he’s got plenty of videographer duties remaining for his fellow PA buddies.